Deluxe Rollator Rolling Walker Color: Flame Red by ProBasics by Invacare at Get Cheap Health Insurance. MPN: 1032MAR. Hurry! Limited time offer. Offer valid only while supplies last. 1032MAR Color: Flame Red Features: -Basket included. -Easy squeeze locking loop brake system. -Removable curved padded backrest for added comfort. 1032MAR Color: Flame Red Features: -Basket included. -Easy squeeze locking loop brake system. -Removable curved padded backrest for added comfort. -Folds easily for transport and storage. -Durable lightweight aluminum frame. -Easy squeeze locking loop brake system. 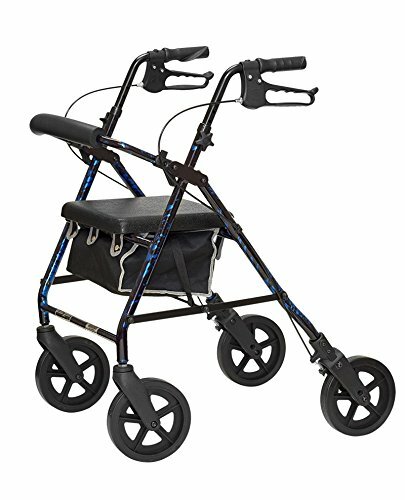 Product Type: -Rolling walker. Age Group: -Adult. Brakes Included: -Yes. Wheels Included: -Yes. Seat Included: -Yes. Release Type: -Trigger. Number of Wheels: -4. Dimensions: -Distance between handle: 21.8". -Distance between rear wheel: 24.8". Overall Product Weight: -16 lbs. Height Standard (22") - Overall Height - Top to Bottom: -35.5". Height Low (19") - Overall Height - Top to Bottom: -31.5". If you have any questions about this product by ProBasics by Invacare, contact us by completing and submitting the form below. If you are looking for a specif part number, please include it with your message.